I made this quilt as a sampler of some free form piecing techniques. Its a fun quilt to make, and especially good if you are searching for a way to "free up" your creative side. There are; wavey nine patches, x's and o's, string pieces and wonky flying geese. The parts can be put together in many different ways, and each quilt in the workshop is "one of a kind". I called it Games Quilters Play, because it reminded me of a Parcheesi game board, and its all about play. The fabric story for this one is stripes and dots, either black on a coloured background or colours on a black background. I love this traditional pattern, the feathered star. It is so dynamic. I made this quilt with fabrics that are either naturally dyed, or go with the natural dye colours. The fabrics are a mixture of floral, Japanese, shibori, stripes, toilles, ikat, Dutch Java prints, contemporary prints and Indian handprints, among others. To make this quilt, one needs a good eye for the exact 1/4" seam, as there are many small half square triangles to fit together, some partial seams and an occasion or two for eight seams to converge in the centre of a block. This is a quilt made from a pattern in the book Tradition With A Twist. I paired unlikely fabrics together for a different effect than the one shown in the book. In this quilt there is a romantic scenic print, some plaids, contemporary dots, a sentimental floral print and an Asian print, with the colours ranging from grey and purple through to pink and gold. These are more examples of what you can do with a log cabin block if you choose to push and stretch. Paper Dolls is a popular class that involves a little fabric and a lot of imagination. Participants use improvisational techniques to make "dollies" from bits and scraps of fabric, each little person arriving in the world different than any other. 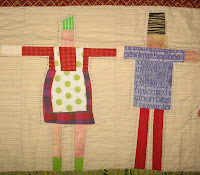 A row of paper dolls holding hands across a quilt can be evocative of childhood, community, a chorus line or can simply be a fun signature for a child's bed quilt. The simpler the dolls, the faster the quilt top goes. Some folks go all out on personalizing their people, but may end up with only a pillow to show for the day's work. A row of paper dolls can find a place in a row sampler quilt, or can be the focus of a theme quilt. 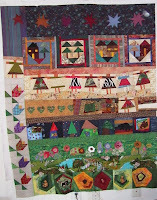 My new favourite quilt class to teach is called "Not Just Another Log Cabin". In the class, we spend the early hours experimenting and inventing new ways and new colour arrangements for log cabin blocks. The second part of the workshop is spent "running" with a favourite idea, or result of the experimentation. 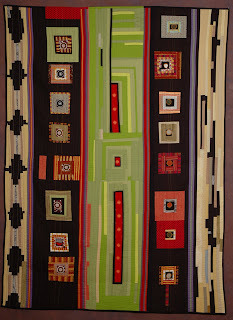 All quilts made by participants are unique and self designed. The quilt pictured here is called "Hi!" and was inspired by a beautiful striped ikat textile from Guatemala. The quilt is a sort of ultra-enlarged version of the inspiration fabric, and was constructed in large stripes to emphasize the linear feel of the original. It is made using the basic log cabin form, a central fabric surrounded by strips, or "logs" to make blocks. 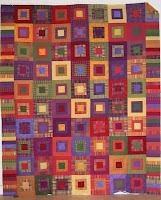 Barb Mortell is a textile artist who has been making colourful studio quilts for over twenty years. Barb remembers spending every waking minute of her childhood making things. She often misbehaved and got sent to her room, just so she could quietly create little creatures out of peanuts and felt and glue. As soon as she could reach the “go” pedal of her mother’s sewing machine, she started to sew. Barb meandered through art school, weaving and textile courses, costuming for film and theatre, retailing fabric, and upholstery work to end up as a quiltmaker, combining her love of colour, texture, craftsmanship, history and art. The quilts she makes now are pieced and quilted one by one, with the help of her beloved sewing machine, and are all original designs which develop as they are being constructed. She loves to combine colourful and visually exciting fabrics and finds inspiration in the accidental friendships that occur in the collision of unexpected bits of patchwork. Her quilts are functional and are made to add art to a bed, but are just as happy to hang on a wall.